Nestle Milk Chocolate 2 Finger Kitkats (Pack of 9) 12339411 - Norwich Office Supplies - Office Stationery and Furniture for Norfolk with Delivery to all of the UK. Get all your Computer Supplies, Print Consumables, Presentation Equipment, Paper, Desking & Seating Right Here! • The Nation's favourite chocolate bar! 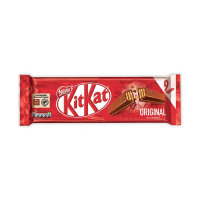 Nestle have spent years perfecting their recipe for NestlÃ© two-finger kitkats: fingers of slender wafer are sandwiched together with chocolate cream and coated with a layer of smooth milk chocolate. Light yet luxurious, it combines crunch and softness in a yummy 107 calorie treat. With no artificial colours, flavours or preservatives this is the perfect solution for that mid-afternoon dip.